Nerdy smart girl is left to care for her older and younger brother as parents travel frequently on business. Friendless, she meets the new boy in high school, a smoldering, mysterious boy who is there as a consequence of his trouble at another school. He is closed off and tough, fatherless, his mother lost in the bottle since the tragic loss of her first born son. The boy is also a remarkably sensitive poet. They are drawn to and repelled from each other throughout the twists of the tale, which weaves in the subplots of the nerdy, boy-scout, entomologist little brother and the iconoclastic, artistic older brother, both outcasts as well trying to find their place in the world. Cicadas has no "high concept," no stars, no instantly marketable hook. What is does have is deft and insightful writing, directing and editing by filmmaker Kat Candler, remarkable performances by the young cast (Lindsay Broockman, Brandon Howe, Paul Conrad, and Bryan Chafin (particularly stand out), and a big, but unsentimental heart. 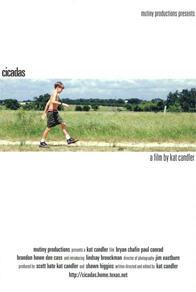 It's a coming-of-age story focusing on young, intelligent, frustrated, misfit kids becoming adults, using the cicada's life cycle as a gentle metaphor for the youngsters' own transformation.